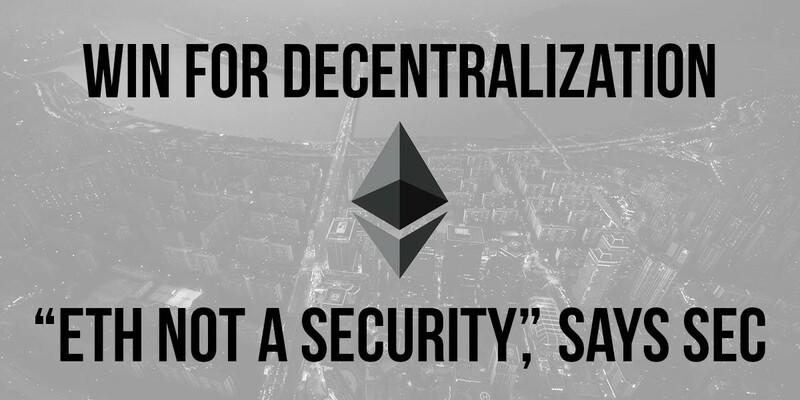 In a move that caught the bear market off-guard, the SEC announced that despite the framework through which Ethereum may have raised its initial funding constituting as a security, it would mean very little to apply security laws to each transaction on the currently decentralized network. This is primarily because a network that is not under a central authority (such as Bitcoin and Ethereum) can be considered safe from such scrutiny. This verdict extends to ICOs as well. A company receiving investments for its token sale would have its tokens labeled as an investment contract, which constitutes a security, in the case of such a central authority requiring these investments for the growth of its network. This is because these essentially serve as shares in the network, with the investors solely relying on the company’s efforts for the development of the network, and thus an increase in the value of their shares. Whereas if the investments are being used for procuring tokens that are used within the network for some form of utility, the laws would not be applicable to it. ICOs will be evaluated on a case-by-case basis to determine if they would be classified as a security, as in the latter case, the disclosure regime of the security laws would aid in mitigating the information asymmetry between the company and its investors. This will ensure that the investors are aware of the risks associated with investing in a project, as well as eliminate any misstatements from the promoters by making them liable for such actions. The news release added that a digital asset may be packaged as a utility token, but its initial offering may constitute a security. It also states that being classified as a security is not a static definition. This seemingly implies that any initial coin offering would be considered as a security offering, even if the token is a clear utility token without dividends, until the point that the network has matured enough to have tokens utilized on it for their intended purpose. This is undeniably an appreciable step forward in the burgeoning industry, as the points of contention were the cause of the uncertainty in the market that aided in its volatility.